The Maxxis Ikon Mountain Bike Tire is Designed to excel in virtually any riding condition you might encounter on the cross country course. It’s a high-volume, lightweight race tire that delivers an optimal combination of cornering control and rolling efficiency. Maxxis has been designing quality tires for years, and you can’t go wrong with this one! Click the link below for full product details. You sure that the EXO version is just 580g? EXO usually bumps weight by a good 80g.Still a light tire. Maxxis make great mountain bike tires with good designs and compounds. Haven’t been to pleased with a Schwalbe rocket Ron, think it may be their Pacestar compound. Ridiculous price too. 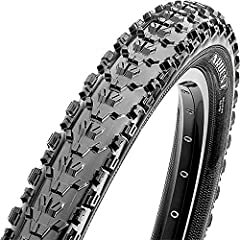 Just bought the 2.35″ Exc version of this tire for the rear of my hardtail in hopes of more cush and trail worthy traction. Expect to be impressed but will see. Love their Beaver for the majority of the year here on southern Vancouver Island, and just 500g! That’s insane for a 26″ tire let alone 29.